Asymmetrical Harp Soundboards — Rees Harps Inc. The innovative Rees asymmetrical harp soundboard explained. Lever harps are often also called Irish harps or Celtic harps. We are also the makers of Harpsicle® Harps. Rees has been building harps since 1972. Our harps are hand crafted in Rising Sun, Indiana, United States. Rees Harps Inc. builds instruments which are unusual in that William has refined a trademark asymmetrical soundboard. 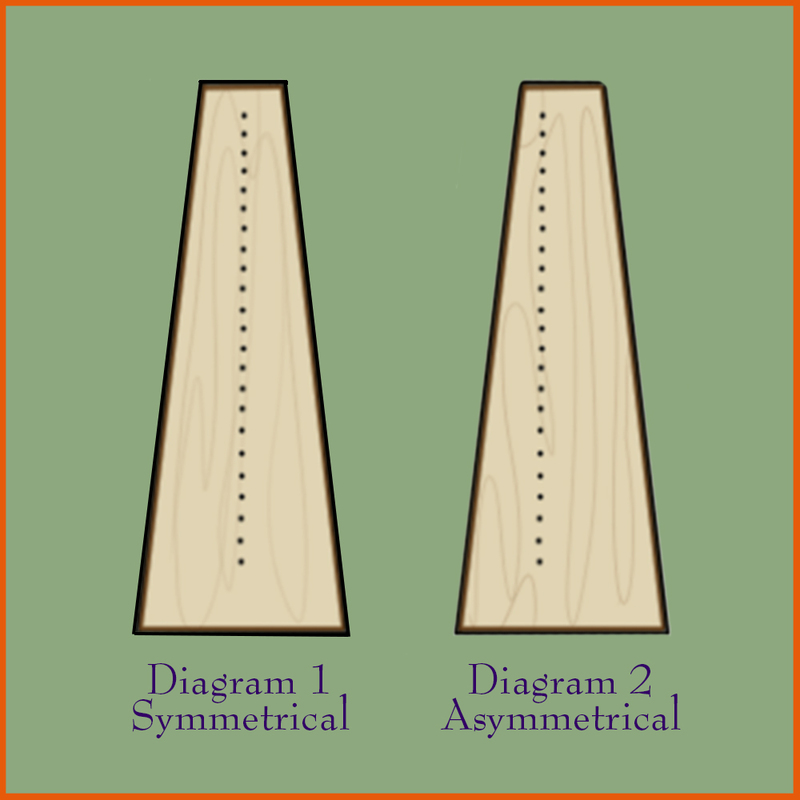 Symmetrical and asymmetrical harp soundboards. A Rees Aberdeen Meadows Concert Line Harp with an asymmetrical soundboard. The purpose of an asymmetrical soundboard is to do for harps what asymmetrical bracing does for guitars or the off center placement of the soundpost and bass bar does for violins. The perfectly symmetrical nature of the traditional harp soundboard (See Diagram 1) lends itself to something engineers call "wave canceling." Wave canceling occurs when two wave frequencies (sounds, in this case) are modulated equally but are opposite. The high point in one wave is canceled out (attenuated) by the low point in another wave. The result is a much diminished voicing. In a symmetrical harp this means that when some strings are plucked they voice more quietly than do their neighbors. The opposite is also true in that symmetrical soundboards can lend themselves to an accidental doubling of a frequency, which, in the harp community, we call a "wolf tone." An asymmetrical soundboard (See Diagram 2) breaks up both of these patterns. Wave canceling is reduced because the various parts of each side of the soundboard are so radically different in configuration that they carry the wave frequencies in a purposefully mismatched manner. Equal and opposite waves are not produced so they do not cancel. Further, the division of the soundboard into two unequal portions means that the two sides of the soundboard are not identical and one side can pick up the tones which the other side might miss. The asymmetrical soundboard eliminates dead and bright (wolf tone) strings, commonly tolerated in traditional harp designs and it produces an even tonal response throughout the full range of the harp. Guitar and violin luthiers have understood these basic elements for well over a hundred years. Guitar luthiers use some or all of a combination of asymmetrical bracing, soundboard thinning and bridge adjustments to eliminate the symmetrical performance of a guitar soundboard. Luthiers of the violin family use some of these techniques and add to them the off–center placement of the soundpost and bass bar. Effective asymmetrical performance in a harp soundboard is best achieved by setting the midrib and strings off-center. Overall, testing has shown that Rees asymmetrical instruments have a greater sensitivity to a wider range of tones than do comparable symmetrical instruments. The real-world test of an asymmetrical soundboard is when a performer goes into a recording studio and works with an experienced recording engineer. Time after time, the feedback to us has been amazement because there is no need to adjust for the harp. Engineers can set the levels to neutral all the way across the board. While no performer purchases their harp because their recording engineer recommends it, it is worth thinking about the fact that recording engineers, by definition, have some of the best and most highly trained ears in the world and while they may have no understanding of harps, they have an acute understanding of instruments as a tool of music and music is, after all, the whole point.